Hey, everybody; Matt here. After last week, we needed a break and we sure got it. "Isn't that guy retired?" you ask, well in an unfortunate development, I realized that I couldn't live off of the corpse of my US life forever and got a job tutoring English. It's well under the amount Sara is working, but hell, I'm working again (ugh). Therefore, we were in need of some relaxation post-haste this last weekend. While we weren't exactly relaxing, we rocked out very hard. laughing at him. This goes on for 30 minutes. I'm pretty sure they're on drugs. 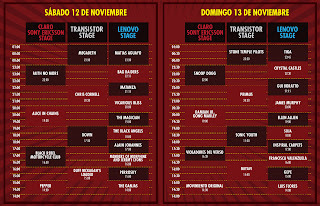 November 12th & 13th saw Sara & I attending the Maquinaria Festival (see the line-up above or visit their website, maquinariafestival.cl). 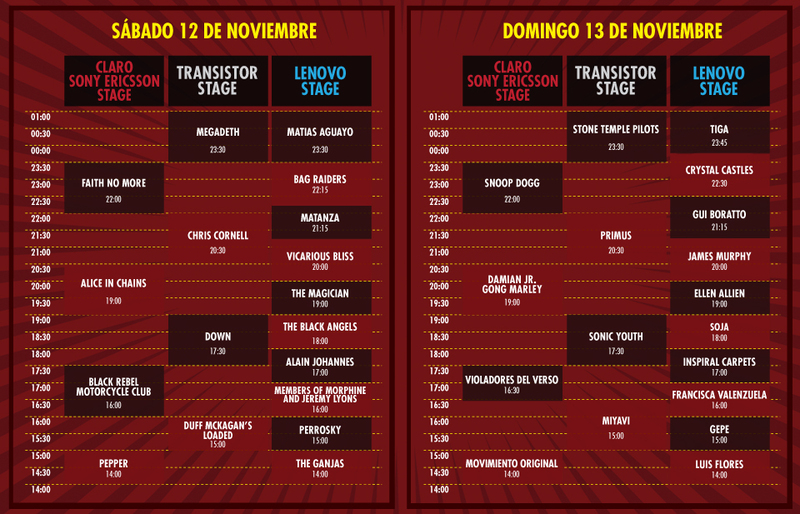 These two days of music promised big names, small names, and one sh*t-ton of live music. Held at the old horse track, Club Hipico, the festival was to be loud, sunny, and beer-filled (I said we were going to a music festival, right?). However, someone missed the boat on that last part; there was no beer sold at the festival unless you had a VIP pass ($40USD extra/day). WHAT A BUST! Despite this letdown, we had a great time seeing bands like Alice in Chains, Megadeth, Black Angels, Black Rebel Motorcycle Club, and many others. Turntables & bright lights. Get your Red Bull! We went to see a DJ, Vicarious Bliss, perform after Alice in Chains. He was clearly a little miffed on stage: there were only about 50 of tens of thousands of people at his show, he was scheduled during a big name performance, and the crowd wasn't dancing as much as he would like (again, no/little beer). Back to him in a minute. In a stroke of massive poor-planning, I had worn shorts and a t-shirt to the festival. As it is really dry here, it gets cold at night quickly. We kept delaying leaving as I wanted to get my money's worth (I will freeze to save a buck). Sara & Vale @ Sonic Youth. Nice wristbands! When we finally were on our way out, we saw Vicarious Bliss sitting on a rock, by himself, by the exit gate. Saying, "Hey, man. Good show." seemed like the least we could do. We started talking more with him, lending him a sympathetic ear, and being people who spoke English well. He then said he had something that would make our days. We thought, "Finally, a beer!" Instead, he pulled out three "Artist Access" wristbands. SCORE! The next day we walked right back in through the exit, flashing the wristbands, and no one stopped us; one test passed. We then went to the small stage side entrance and again walked in; #2 passed. The main stage, where the big acts played was the last test; hat trick. We immediately called up Charlie and Vale and told them to come down. We were able to get Vale in on an artists' pass, give one of our tix to Charlie, and sell the other to a scalper. Yes, that is Les Claypool and a giant spaceman. By the end of the day, we had seen, talked with, drank with, and hung out with people from several bands. The highlight of the day was definitely seeing Primus from backstage; it was incredible. I also particularly liked hearing from Sara, Charlie, and Vale how during the Damian Marley show they all of a sudden noticed me standing off to the side of the stage ("Surprise!"). Nothing like free, cold hot dogs before the riot police swoop in. After rounding out the evening seeing Snoop Dogg and Stone Temple Pilots, we retired to our neighborhood for some more drinks at our local dive, Mano Manja (Nun's Hand). We're still tired, but still very happy, days later. This is just a weird thing we saw en route to the festival by the Mercado Central (big seafood market). That is a keyboard plugged (only) into a small tree. Strange.